Back in December we heard a rumor that the Samsung Galaxy Tab 7.7 would be headed to US mobile carrier Verizon Wireless, Verizon and Samsung have now confirmed that the Galaxy Tab 7.7 will be available on Verizon. As a reminder, the Samsung Galaxy Tab 7.7 features a 7.7 inch Super AMOLED Plus touch screen display with a resolution of 1280 x 800 pixels, it will come with Android 3.2 Honeycomb, and 4G LTE. The Samsung Galaxy Tab 7.7 is powered by a dual core 1.4GHz processor and it also features 1GB of RAM, plus two cameras which include a front facing 2 megapixel camera and a rear facing 3 megapixel camera. Other specifications on the Galaxy Tab 7.7 include a choice of either 16GB, 32GB or 64GB of built in storage, plus a microSD card slot which can take up to 32GB cards, it also features 802.11 a/b/g/n WiFi, Bluetooth 3.0 and A-GPS. 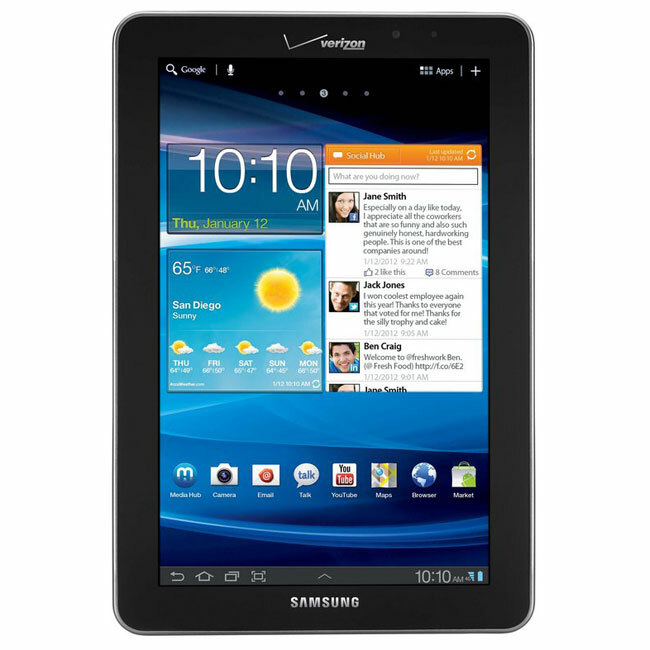 Verizon as yet haven’t released any details on when the Samsung Galaxy Tab 7.7 will be available on their network in the US and we don’t as yet have any details on pricing, as soon as we get some more information we will let you guys know.